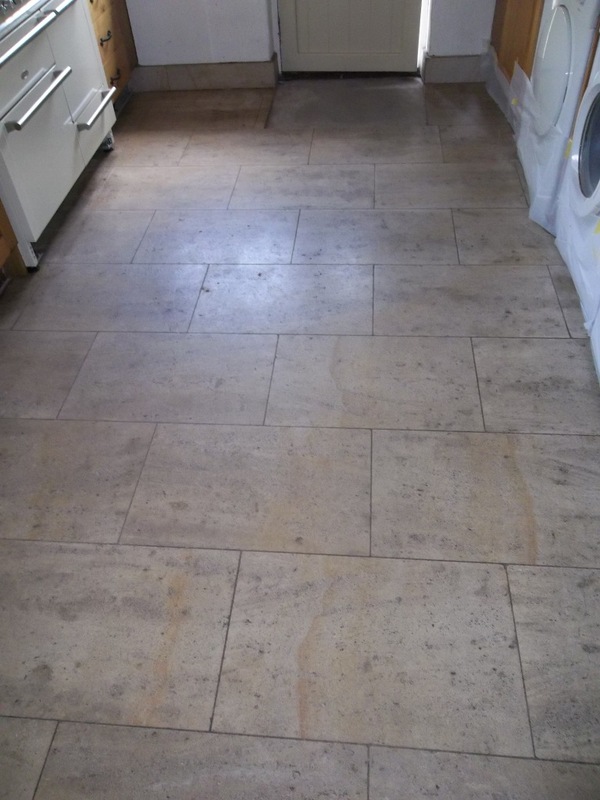 I was recently contacted by a lady in the small village of Eldwick near Bingley who wasn’t happy with the condition of her French Limestone floor which had hadn’t been professionally cleaned for some time. 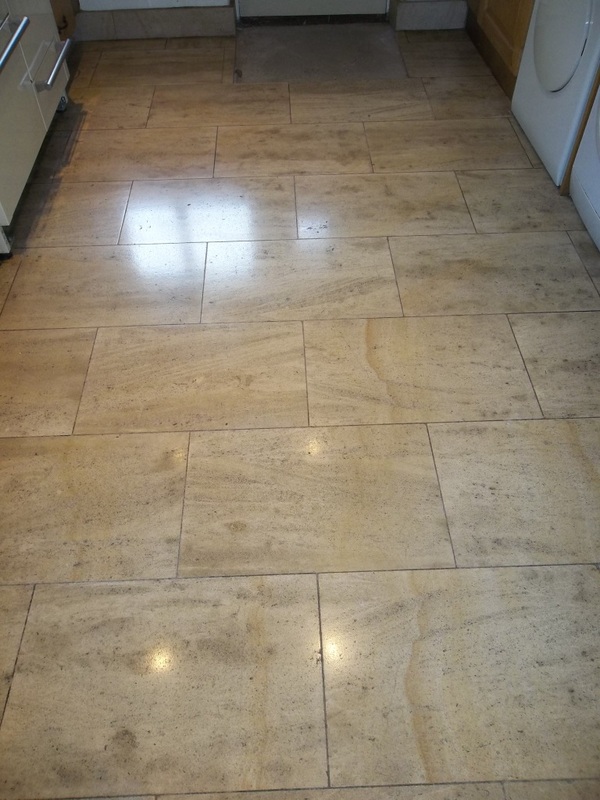 The French Limestone tiles had been laid throughout the kitchen and dining room and as you can see in the photograph below now looked dull, dirty and uninviting. The floor needed a deep clean and seal to bring it back to its’ best however before I could do that I needed to determine the best method to use. I duly carried out a survey and test clean which showed how the floor could be improved and discussed the quote for the work with the client, they were really pleased with the test area, accepted the quote and we arranged a convenient time to carry out the work the following week. Arriving on site a week later, my first task was to cover all the kitchen units with protective covering to protect against splashing. The last thing we want is to cause any damage to the surrounding areas. The next step was to use a set of diamond burnishing pads from Grits 400 to 1500 to clean and polish the Limestone tiles. The pads are fitted to a rotary buffer and applied in sequence with water to lubricate, the process removes inground dirt and rebuilds the polish on the Limestone. Small hand-held burnishing blocks are used to reach the more intricate areas. The floor is then rinsed with more water after each pad has been used and the resultant residue is removed with a wet vacuum. Once I was satisfied that the dirt had been removed from the floor, I then worked on the more stubborn grout lines with a strong dilution of Tile Doctor Pro-Clean and a stiff grout brush to get any remaining deposits out of the grout lines. This is a great multi-purpose high alkaline cleaning and stripping product brilliant for heavily soiled and stubborn neglected tiles and very good on very dirty grout. With the grout clean I then applied the last 3000 grit burnishing pad to really bring up the polish on the Limestone floor, this pad is applied dry with a little water sprayed onto the surface of the stone. The floor was then left to dry off completely overnight. The following day I checked that the floor was dry using a moisture meter before applying Tile Doctor Ultra-Seal to the floor. This is a premium, no-sheen, natural-look penetrating sealer which is formulated to provide maximum stain protection, it’s also recommended for busy kitchen areas and is an excellent grout sealer. Once the sealant was dry I did a water drop test to confirm that the floor was properly sealed. I hope that you can see from the photos the improvement in the appearance of the floor. The client was really happy with the floor which lifted the whole room and made the kitchen like new again.